The Sessions bolt-on allows you to set recurring homework tasks for your class or for multiple classes. You can specify the type of game you want them to play, e.g. Garage games. This will then lock them out of the other game modes until they've played the necessary Garage games. Once they've played the required games it will unlock the other types. It will give you a results page to show you who has completed what. You can get the homework to recur every day/week/month and set an end date. You can apply the homework to one/some/all classes at once. So you could set homework for the whole school for the whole year in about 30 seconds! The Sessions bolt-on costs 0.19 USD per day and existing users can order and immediately activate it from your Subscription Details page, while new users can add it to a new subscription when they register. The following is a short guide to help you make the most of the Sessions Bolt-on. 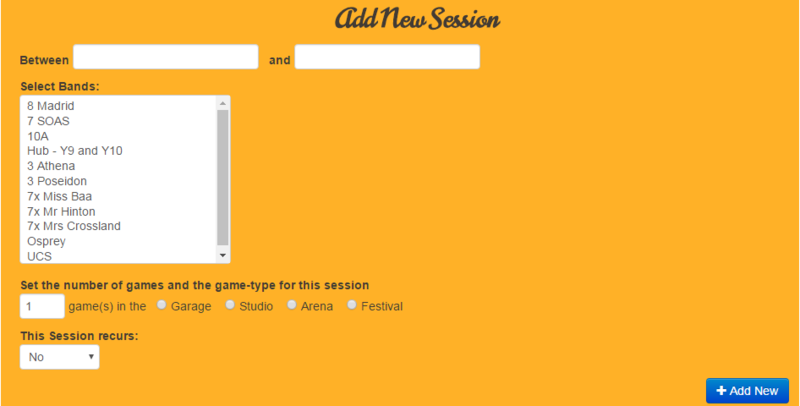 Scroll to the bottom of the page where you will see an orange box titled “Add New Session”. Set the date of the session. Select which bands you want it to apply to. Set the number of games you want them to play and in which game mode. Simply select yes to “This Session recurs” when adding a new Session. Select whether it recurs daily, weekly or monthly. Select the date when you want it to stop recurring.